Home→Blog→Uncategorized→Announcing the Millheim Audio Flea! 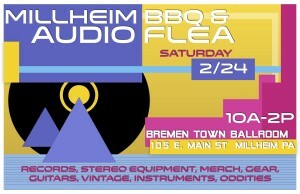 Announcing the Millheim Audio Flea! We’re excited to host the Millheim Audio Flea Market as part of our market series at the Bremen Town Ballroom! Vendor spots are still available, email Erin at ecovents@gmail.com. This is gonna be so great and the food will be just, you know, bbq and amazing!